A top U.S. regulator’s ties to Monsanto Co. (MON), a maker of genetically modified food, are fueling an election-year recall push by consumer and public-interest groups flexing their clout on the Internet. Michael Taylor, the Food and Drug Administration’s deputy commissioner for food safety, is at the center of a burgeoning dispute between opponents who have amassed more than 420,000 signatures on an online petition demanding he be fired and supporters who praise his efforts to curb foodborne illnesses. 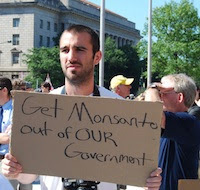 At issue are the 16 months ending in 2000 that Taylor worked as St. Louis-based Monsanto’s vice president for public policy, between stints in the Clinton and Obama administrations. The petition reflects anger over the agency’s enforcement actions against small food producers and products such as raw milk and may prove embarrassing to a White House eager to distance itself from corporate interests, said Marion Nestle, a New York University professor.